When performed well, you can understand why people just can't say no to this classic Rodgers & Hammerstein musical. 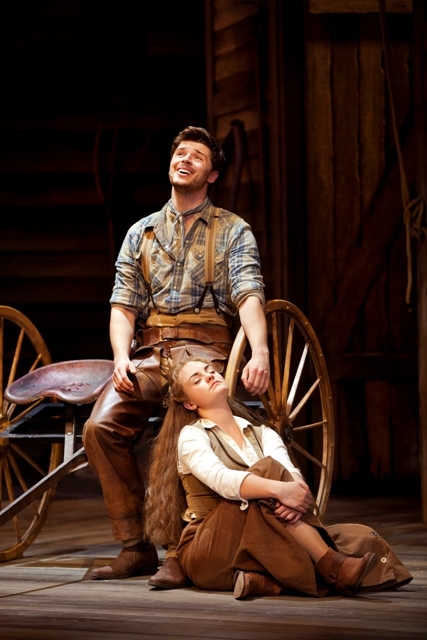 This slick production of Oklahoma! is a dream of a show that brings all the essential elements together with romance, comedy and jealousy combined with good casting and excellent performances. Dreamy, romantic scenes in Oklahoma! Oklahoma! features some of the most enchanting songs in musical theatre. Opening with the uplifting tune Oh, What A Beautiful Mornin', the show grips hold of your heart through People Will Say We're In Love and I Cain't Say No, and doesn't let it go, long after the rapturous finale of iconic song Oklahoma. I caught the tour at Birmingham Hippodrome, where is stops off from June 30 to July 4. It also heads to Cardiff, Bristol, Sheffield and High Wycombe before August 8. 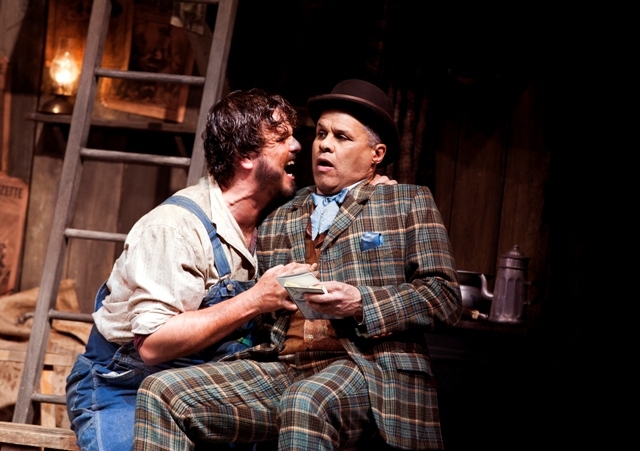 Lovable characters including Ado Annie (Lucy May Barker) and Ali Hakim (Gary Wilmot) in Oklahoma! Following the escapades of a host of lovable American characters in Oklahoma in the early 1900s, when it was still known as Indian Territory, the audience is treated to high jinx, romance and even something much darker and obsessive amid cowboys, farmers and their families. It balances the action between the burgeoning romance of fiesty Laurey and cowboy Curly; the comedic antics of Aunt Eller and travelling salesman Ali Hakim and the hilarious exploits of amorous young Ado Annie (who sings about how she can't say no to the boys). Stealing the drama limelight, however, is menacing, bulky work-hand Jud, whose scary intentions for Laury send shivers down the spine. Nic Greenshields is outstanding as Jud and has a deep, devilish voice for song Lonely Room. To match the big songs, director Rachel Kavanaugh has created some extensive dance scenes with choreographer Drew McOnie, none more spectacular and creative than Laurey's dream sequence that involves cowboys rolling rhythmically on balls of hay. Ashley Day plays our hero Curly with endearing cheekiness and it's difficult to understand why Laurey (a sort of feminist of her day) would give him such a hard time when he sings to her with that adorable harmonic voice. Charlotte Wakefield, playing Laurey, has more than a passing resemblance to Shirley Jones, the actress who played the role in the famous Hollywood 1955 movie of Oklahoma! Her chemistry with Day helps make this show such a success as you get genuinely swept up in their romance. 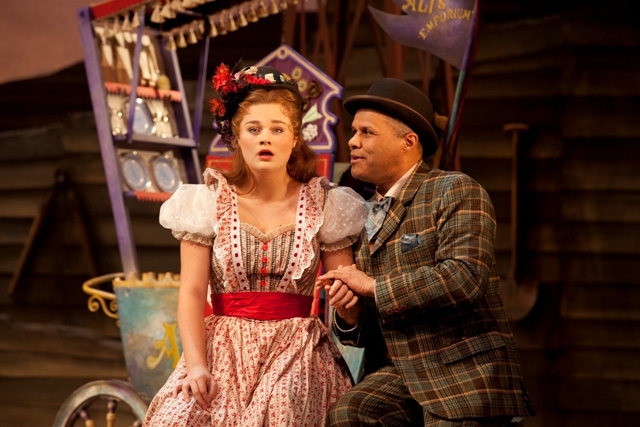 Vying for the audience's affections is Gary Wilmot as peddler Ali Hakim - a sort of Wild West Poundland on wheels. His winning smile and amiable style are put to regular good use in Birmingham Hippodrome's panto, and he adapts them into this role in the same comedic fashion that earned him the biggest applause at the curtain call. Then there is Belinda Lang, once seen regularly in BBC sitcom 2Point4Children. 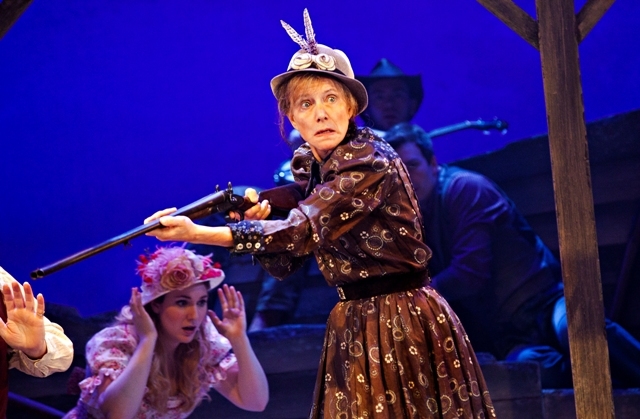 She seems hardly recognisable as elderly Aunt Eller as she embodies the straight-talkin', tobacco chewin' matron of the territory, who always has everyone's best interests at heart. Moving smoothly between the various storylines, the pace is constant and attention-grabbing, as is the stunning scenery recreating that wide blue expanse of sky that Oklahoma has become famous for. This Oklahoma! 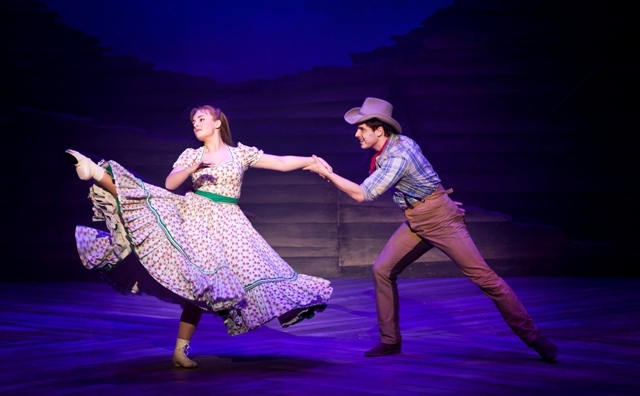 production is a must-see ride into the wild west that will leave you thrilled, uplifted and romanced. It's a definite yee-haw from me. Tickets cost £18-£40. For more information, visit the Oklahoma! tour website or the theatres listed below.